Shepherd’s purse (Capsella bursa-pastoris), a member of the mustard family and a European native seeded throughout North America, is an annual nitrogen fixer that finds its home in disturbed soil in need of some fixing. A precious weed is how I think of shepherd’s purse. In late winter, a basal rosette of clasping, dandelion-like, toothed leaves appear, followed in early spring with long, graceful stems of flattened, heart-shaped seed pods, staggering their positions around the central stem, appearing to upwardly climb to the tip where the remaining cluster of tiny, white flowers bloom. Shepherd’s purse (Capsella bursa-pastoris), a member of the mustard family and a European native seeded throughout North America, is an annual nitrogen fixer that finds its home in disturbed soil in need of some fixing. The name comes from the shape of the seed, resembling the bags shepherds carried in the Old World. 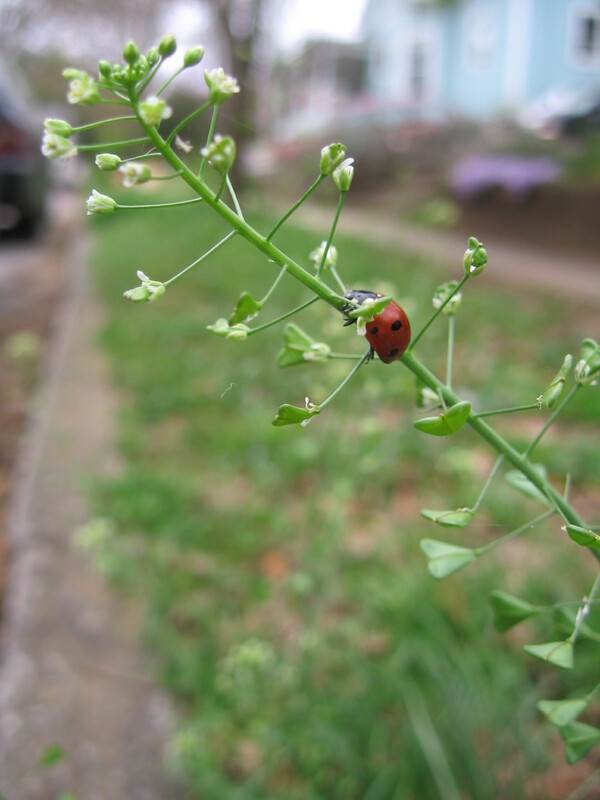 According to “Wildman” Steve Brill, an urban forager in New York City’s Central Park, the sticky seeds inside the purse cause minute insects to adhere to them, while the shepherd’s purse seed carnivorously assimilates the insect into the baby plant. Fortunately, we’re not minute insects, or else this plant wouldn’t be so precious. Early spring greens of shepherd’s purse are very edible. When the plant flowers, the leaves become less tasty. Although the leaves can be eaten raw in salads, more often the raw greens are soaked overnight or cooked, the way various Native American tribes prepared them. The seeds can be ground into flour, or added to other flour sources for nutrient variety. According to Minnesota herbalist Matthew Wood, shepherd’s purse contains flavonoids, carotenoids, potassium, amino acids and vitamins A, K, and C.
Medicinally, the above-ground parts of shepherd’s purse are used as an astringent, drying agent for kidney troubles, weak bladders, diarrhea, dysentery and excessive menstruation. Woman who have uterine fibroids have found benefit through shepherd’s purse’s ability to tone and lift the uterus. Historically, shepherd’s purse was used as a substitute for ergot, a fungus on rye plants that was used as an oxytocic drug stimulating uterine contractions. Externally, shepherd’s purse has been used as first aid medicine for nosebleeds and wounds that won’t stop bleeding. In Germany, where medicinal plants go through rigorous scrutiny, shepherd’s purse is approved for nosebleeds and excessive or irregular menstruation. If you have shepherd’s purse growing nearby, an aesthetic use for the heart-shaped seedpods is to add stems of them to bouquets as a dainty filler. Since there’s no real risk of shepherd’s purse becoming unruly, let it do its soil healing. Eat the foliage and then cut or mow it before the seeds dry on the stem if you don’t want it to spread.